H. Rick Bamman - hbamman@shawmedia.com Jacobs head coach AJ Cappello shouts encouragement to his team from the bench in the second period. Jacobs lost to Conant 5-1 in the Bartlett Class 3A Boys Soccer Supersectional on Tuesday, Nov. 1, 2016 in Streamwood. 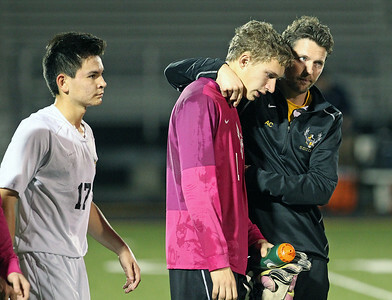 H. Rick Bamman - hbamman@shawmedia.com Jacobs head coach AJ Cappello comforts goal keeper Ethan Pickering after the 5-1 loss to Conant in the Bartlett Class 3A Boys Soccer Supersectional on Tuesday, Nov. 1, 2016 in Streamwood. Michael Pasetes is at left. 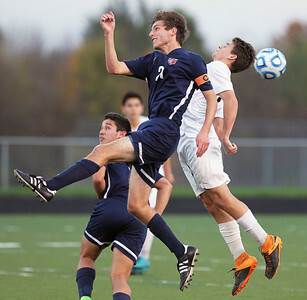 H. Rick Bamman - hbamman@shawmedia.com Jacobs' Noah Melick bumps the ball in front of Conant defender Tommy Biernat in the first period during the Bartlett Class 3A Boys Soccer Supersectional on Tuesday, Nov. 1, 2016 in Streamwood. Jacob's lost, 5-1. H. Rick Bamman - hbamman@shawmedia.com Jacobs' Jacob Moser (front) and Jacob Sabella react at the end of their season after the 5-1 loss to Conant in the Bartlett Class 3A Boys Soccer Supersectional on Tuesday, Nov. 1, 2016 in Streamwood. 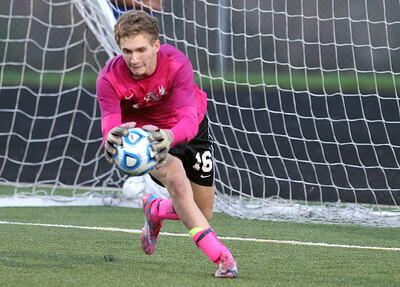 H. Rick Bamman - hbamman@shawmedia.com Jacobs keeper Ethan Pickering makes a save in the first period in the Bartlett Class 3A Boys Soccer Supersectional on Tuesday, Nov. 1, 2016 in Streamwood. Jacobs lost to Conant 5-1. 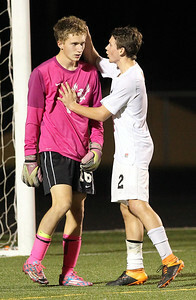 H. Rick Bamman - hbamman@shawmedia.com Jacobs' Gabriel Swarthout (right) encourages keeper Ethan Pickering in the second period during the Bartlett Class 3A Boys Soccer Supersectional on Tuesday, Nov. 1, 2016 in Streamwood. Jacobs ended the season with a 5-1 loss to Conant. H. Rick Bamman - hbamman@shawmedia.com Jacobs' Gabriel Swarthout heads the ball behind Conant's Kevin Sindewald in the first period during in the Bartlett Class 3A Boys Soccer Supersectional on Tuesday, Nov. 1, 2016 in Streamwood. Jacobs lost, 5-1. H. Rick Bamman - hbamman@shawmedia.com Jacobs players position for a penalty kick in the second period against Conant in the Bartlett Class 3A Boys Soccer Supersectional on Tuesday, Nov. 1, 2016 in Streamwood. Jacobs lost, 5-1. 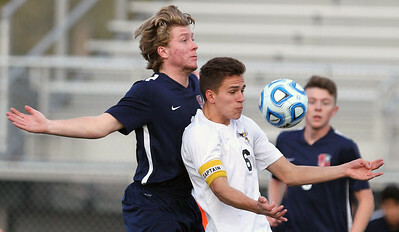 H. Rick Bamman - hbamman@shawmedia.com Jacobs' Colin Walsh heads the ball in front of a Conant defender during the Class 3A Bartlett Boys Soccer Supersectional on Tuesday, Nov. 1, 2016 in Streamwood. 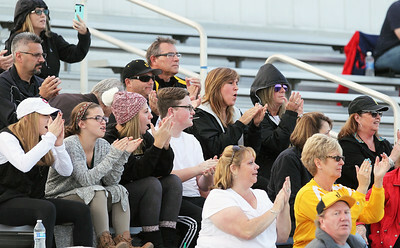 H. Rick Bamman - hbamman@shawmedia.com Jacobs fans cheer the Eagles in the Bartlett Class 3A Boys Soccer Supersectional on Tuesday, Nov. 1, 2016 in Streamwood. Jacobs' Jacob Moser (front) and Jacob Sabella react at the end of their season after the 5-1 loss to Conant in the Bartlett Class 3A Boys Soccer Supersectional on Tuesday, Nov. 1, 2016 in Streamwood.